K Chandrashekhar Rao all set for the state elections after dissolving the Telangana Assembly. He has also revealed his plan for the election and KCR also said that his party Telangana Rashtra Samithi won’t go for the pre-poll alliance with the BJP. ‘TRS is a 100% secular party. How can we join hands with BJP,’ KCR asked while addressing the media on Thursday. KCR also attacked Congress and its chief, Rahul Gandhi, while addressing to the public. 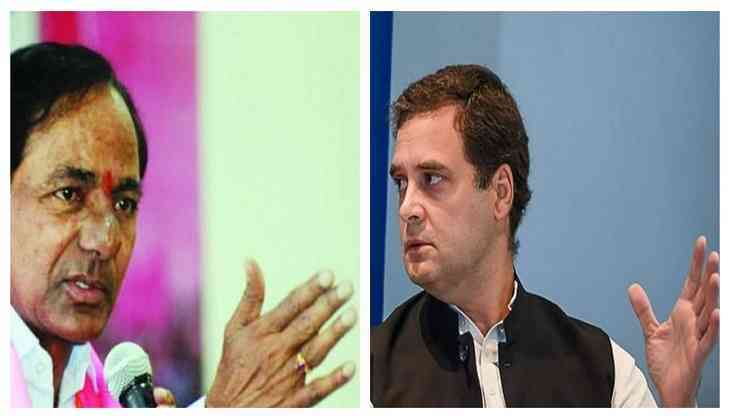 He also told that ‘Rahul Gandhi inherited the legacy of Congress Delhi sultanate, he is the legal heir of Congress empire of Delhi.’ KCR further appealed to the people that not to become the slave to Congress, slaves to Delhi. He also said that the fate of Telangana should be decided in the state only. Rao also said that everyone knows that what Rahul Gandhi is. He called Gandhi the biggest buffoon in the country. As he reminded everyone Rahul activity that the way he hugged PM Narendra Modi and later, winking towards his party members. He also mocked at Congress Chief and said that ‘Rahul is a property for us, the more he comes (to Telangana) the more seats we will win. A PTI report said that ruling Telangana Rashtra Samithi said the aim is to leverage what they call the "feel good factor" prevailing in the state which has received good rainfall.